A Cafe Fence Helps to Promote your Business Using Custom Graphics! This cafe fence is an additional printed banner for use with our huge range of coffee barriers. 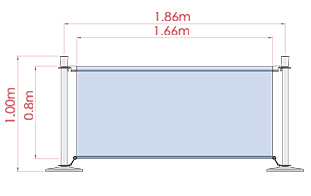 These units are perfect for adding to your existing configuration or upgrading from our solid colour range of banners. The high-quality banners make an impression in any location. This coffee barrier, cafe fence uses a dye-sublimation process to print your custom designs on the fabric. This provides a vivid representation of your graphics in full-colour for an eye-catching display that will surely grab the attention of passersby. This professional looking display is perfect for a number of different locations, including exhibition halls, cafes, restaurants, bars, night clubs, outdoor events, and trade shows. Easily create an outdoor seating area or section off parts of your grounds to help guide crowds into proper areas with these displays. You can choose to have single or double-sided printing on these banners depending on your needs. There is no reverse printing either, ensuring a proper looking display for patrons to view. The banners themselves are made from a hard-wearing nylon-weave that will last for years to come in any environment. 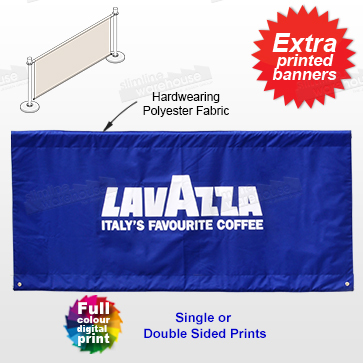 These coffee banners have a channel in the top of the fabric to easily slide the steel pole through for attachment to stanchions. The eyelets in the bottom attach securely to the base of the stanchions to create a wind barrier to allow patriots to enjoy their time at your business without being bothered. Order today for your company to leave an impression! 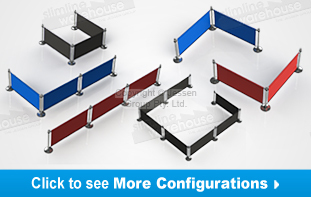 Coffee barriers in many configurations can be chosen in order to fit your specific business needs. By using printed banners at your location, you ensure you show the exact message, logo, or design to potential patrons to draw them into your business. Our online catalogue is available for browsing by clicking here. We currently have hundreds of items in stock that are broken down into categories to easily find the item you are looking for. From iPad stands, standoffs & light boxes to exhibition displays, business card holders, and whiteboards, there is something for every business to utilise! Slimline Warehouse has been a leader in POP, exhibition, & POS products for over 20 years, becoming Australia's #1 supplier for many products. Our low prices can't be matched, & we provide only high-quality materials in our displays for long lasting use. Order for your business today for faster despatch to anywhere in Australia, including Melbourne, Sydney, Perth, Cairns, Adelaide, Canberra, Brisbane, Darwin, Alice Springs, & Hobart!